Every so often the rock gods give us a record along the way to sort of act as a capsulized recap of a lot of earlier themes we’d covered and sure enough, like clockwork, here they are again doing just that as we near the midway point of 1949. On its surface this is a fairly uneventful offering but as we know it’s what lays under the surface that can make for the most enlightening revelations. It may be lacking intrigue, and as a cover record of a bigger star’s hit it’s certainly lacking originality, but there’s more than enough opportunity within to get some vital insight into the folks who were busy shaping rock ‘n’ roll as it hurtled towards the end of the decade. The Robins were making their “second” recording debut with this session. Their first came under a different name – The Four Bluebirds – for a different label (Excelsior) where they merely were credited as the “featured” vocalists on a record by Johnny Otis who wrote and played on it with his crack band. Having gotten a taste of the opportunities available in the growing rock field the group changed their name to one they chose themselves, The Robins, and headed down the road to Aladdin Records where they cut a session on their own. Mere days after doing so the first of those records, this one, was already on the streets, albeit for Aladdin’s new Score subsidiary, and thus the career of a group that would remain active and quite successful for over a decade was officially launched. Nowadays this type of independent behavior is nothing to draw your attention. 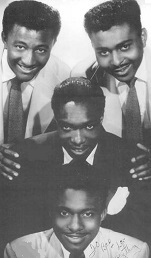 All rock artists seem predisposed for chasing glory and so name-changes, label hopping and stepping away from a well-regarded music visionary who’d gotten you together in the first place by combining one group, The A-Sharp Trio, with a solo singer, Bobby Nunn, to form a potential rival to the headline making Ravens, would be standard operating proceedure in any other era. But in 1949… well, it was still just a little brazen. After all, these guys were competing in Otis’s Amateur Night competitions at the Barrelhouse Club just a few months earlier and were barely out of their teens when they made this move. It’s also not as if they were being heavily recruited by other companies already which might’ve given them swollen heads. It’s doubtful anybody in the industry even knew they existed yet and after changing their name from the one Otis hastily applied to them for the purposes of that one side of one record – My Baby Done Told Me – any recognition they might’ve been due wouldn’t be as forthcoming if they had to first explain it was they who’d sung it and perhaps show some valid identification to prove they were the credited Four Bluebirds after all. Yet that’s what makes The Robins so emblematic of the mindset of the burgeoning rock generation. That all encompassing belief in yourself which comes from unfettered youthful ambition and a blissful ignorance as to the accepted concept of having to “pay your dues” before you’re deserving of any credit or opportunity. Nope, in rock ‘n’ roll it quickly became obvious that the younger the artists the more brash their expectations would be and the bolder the steps they’d take to ensure they got a chance to make a play for the brass ring. So it was The Robins landed at Aladdin Records fully expecting to emerge as stars. The group cut the standard four song session in late May and three of the songs they wrote themselves. Now let’s just take a moment to say that for a group that was all of a few weeks old and who’d only been together in a recording studio just one time prior to this, for them to have written three original songs was pretty impressive. In fact for 1949 it was very impressive. We don’t have many rock vocal groups to compare them to, but those we do, namely The Ravens and Orioles, weren’t nearly as prolific in that regard. The Orioles didn’t write anything of their own and The Ravens came up with a few good sides, but that was with their musical arranger – and unofficial fifth member, pianist Howard Biggs – doing the heavy lifting with the compositions. So chalk this up as yet another sign that The Robins were vanguards of a new way of thinking when it came to rock ‘n’ roll being a form of self-expression. But of course, as stated, this was the one they DIDN’T write, and while the title itself – Around About Midnight may not be recognizable to most, the fact is the song had been a huge hit the year before by its creator (and writer) Roy Brown as ‘Long About Midnight. Why the name change is anybody’s guess. Maybe they simply got it wrong at the printers, for the group clearly sings the right words. Or perhaps Aladdin was trying not to be quite so obvious about their actions, hoping that a similar title rather than an identical one might draw some curiosity rather than possible derision or scorn (and actually the label spelled it Around About Midnite to further confuse matters). Whatever the reason your guess is as good (or as bad) as mine, but this does afford us the chance to assess the creativity of The Robins in other ways, such as how they as a four man vocal group would tackle a song which had been done by a single vocalist. And not just ANY vocalist mind you, but Roy Brown, one of the most emotionally expressive singers in all of rock, someone who could wring tears from a hunk of quartz and have you convinced the world was about to come to a dire end on songs as forlorn as this one. Now add to the fact that Brown was a tenor with the ability to soar to hit notes that The Robins bass lead, Bobby Nunn, could only see through a telescope and the possibilities for reinvention are fairly strong provided they take the opportunity it presents them. Maybe not surprisingly they don’t. How much effort went into B-sides to begin with after all and when you have three hours to cut four songs it’s understandable that they tackled this in similar fashion. But that doesn’t mean Around About Midnight comes across as a strict knockoff even though conceptually it certainly is. Let’s get the similarities out of the way first just so we can take more time focusing on the slight alterations. The tempo, the emotion of Nunn’s delivery and his vocal inflections are pretty close to identical right down the line. I’d add in the rather obvious point that the lyrics are the same, but Bobby messes up along the way – adding the word “may” one time too many – so I guess that qualifies as a difference, though hardly for the better. With all that said it is no big shock that this can’t compete with Brown who mines this territory first and with far more pathos than Nunn can render. In Roy’s case you believed the tale he spun was 100% authentic, while here you know that they’re just playing a part. It still works well enough because the song’s melody is unchanged, the sentiments are still a powerful reflection of regret, resentment, despair and loneliness brought about by a double dealing woman who leaves our narrator after his fall from grace. Bobby Nunn doesn’t do much to embellish this but he almost can’t help but give it a different feel because his vocal chords are so different than Brown’s. Whereas Brown was crying his lyrics in the best gospel tradition, Nunn is moaning them in a far more weary tone. The message is the same but the internal reaction each singer is having to the predicament seems altered. Brown was so distraught he was on the verge of needing to be sedated for his own safety. Nunn on the other hand seems to have a hint of vengeance on his mind. It’s a much less nuanced performance and nowhere near as powerful, but it’s not ineffective for conveying a very real emotion in what he’s singing. The other Robins contributions are subtle, but at times fairly striking. Their discreet wordless harmonies add a slight melodic twist and bring some underlying tension to the performance. A sense of anticipation that something might happen – what we don’t quite know and nothing really comes of this, outside of the rather weak group vocal response in the close – but for something chalked up to incidental support it hardly goes unnoticed. The other notable addition is that of the guitarist as the main accompanist. Whereas Brown had blaring horns, a more emphatic drummer and consistent piano embellishments, The Robins turn over the primary support after a piano intro to the electric guitar which obviously changes the entire ambiance. Both renditions use their respective backings to bolster the vocals, so if you prefer Brown’s more emotional delivery the horns go a long way to establishing his frazzled state of mind, swelling in volume suddenly before dropping away as he returns to a more crestfallen mood. But the tortured anguish of Nunn’s reading is perfectly reflected by the biting guitar which wraps itself around each line, extending his thoughts in wordless fashion. Even if you were to give a slight edge to the individual components of the backing to The Robins version however, and that’s no sure thing unless you’re a stalwart fan of later guitar-based rock styles, Brown’s is the more complete package. The song was crafted for his type of over-the-top delivery and few could pull off such naked emotion as well as he could. But The Robins hardly embarrass themselves on Around About Midnight and their decision to cut this, or Aladdin’s decision perhaps, shows that far from being a loosely connected style, rock was a already seen as a singular entity, something that artists, labels and audiences alike gravitated consistently towards even when the individual records had very distinct differences. Here those differences are accentuated by virtue of the makeup of the group, but the idea they seemed to hold that their record might find an equally receptive ear is a promising show of confidence. Sometimes in the future we have a tendency to question the intent of things where no verbal confirmation is available, but hearing this lets us in on their collective mindsets as well as any Q&A ever could. When seeking to make their name in music The Robins knew where to head from the very start. That it’s not quite as good doesn’t really matter because it’s still good enough. Leave a reply on "The Robins: “Around About Midnight”"